One might argue America’s most beloved chickens wings are churned out of a former teriyaki stand in Southeast Portland. Each week, thousands of pounds of these wings are brined, fried, and glazed to sticky-spicy-sweet perfection from the depths of chef Andy Ricker’s A-frame, all-about-wings shack. 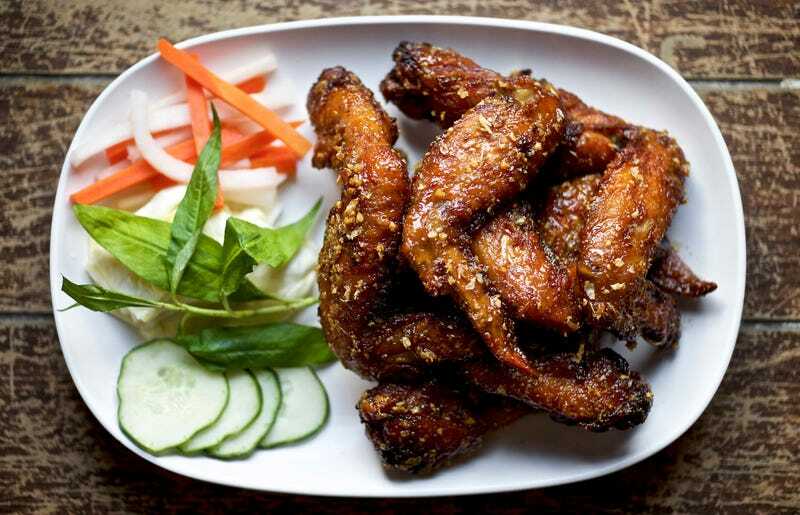 This is ground zero for the Pok Pok empire, arguably the most famous Thai restaurant in America, and much of its success could directly be attributed to these addictive Vietnamese-in-origin wings. Those crispy, chewy umami bombs—lacquered in fried, caramelized garlic and nam prik pao, the spicy roasted chili paste—have been a staple since the moment they landed on its menu more than a decade ago. Their success, thanks in large part to Flavortown mayor-for-life Guy Fieri, started at a time when few Western home cooks had even heard of fish sauce and helped launch more than half a dozen restaurants across Portland and Brooklyn. Ricker first encountered the wings at a bia hoi, or fresh beer stand, in Saigon while traveling in Vietnam 15 years ago. The tiny, side-street joint poured mild keg beer by the pitcher and offered a short English menu to diners relaxing on mini plastic stools. Ricker said doesn’t remember the other dishes, but the fish sauce wings stuck with him. They were one of the best things he’d eaten that entire trip through China and Southeast Asia. He scribbled a note about them in a notebook and knew he had to make them when he got home. Two years later, notes long lost, Ricker stood in the basement of what would later become Pok Pok, then just an erstwhile sushi shack, struggling to bring his memory of those fish sauce wings back to life. His version lacked the sweet, garlicky punch he remembered tasting at that stand in Vietnam. It wasn’t until he asked his then-first and only employee, Ich “Ike” Truong, whether he knew what Ricker was trying to recreate. Truong, who had previously worked with Ricker at his house painting company, asked for two pounds of chicken wings and in 30 minutes had reanimated those intangible wings with more sugar and a crucial addition: garlic water. The recipe has since been tweaked in order to scale up to meet the demand of the thousands of pounds of wings Pok Pok sells. These days, the Portland restaurants go through more than three tons of fish-sauced wings each week during its summer months. The secret to their addictiveness, Ricker modestly and correctly states, is that they’re perfect, whether on their own or chased with light beer. The word “addictive” has become tragically overused in describing food, but there really isn’t a better descriptor for these wings. They’re sticky and ultra-crisp, thanks to a light dredge of rice and tempura flours and shellacked in what’s basically a fish sauce caramel. That caramel—it’s sweet and funky, but never fishy in a way that scares off most fish sauce neophytes. A decade ago, fish sauce—the amber pillar of Southeast Asian cooking, fermented from salt-coated fish—was a condiment rarely found outside Asian or specialty grocery stores. Today, it’s practically America’s sweetheart, the secret ingredient guaranteed to ramp up tomato sauces, bloody Mary’s, or any sauce in need of a savory boost. And it’s now available at your neighborhood grocery store. There’s no proof Pok Pok’s wings helped establish fish sauce’s place in today’s culinary vernacular, but they certainly didn’t hurt either. Ricker was arguably among the first non-Asian chefs in America to popularize the condiment, shining a light on its potential and pulling back the curtain on the formerly elusive world of Southeast Asian cuisine. And while it has been used in Asian countries for centuries, it took Ricker—and credit where due—Guy Fieri to catapult fish sauce, and those wings, into the mainstream. While Portlanders live in a bubble where Indian, Thai and Israeli foods are standard fare, Ricker said that to a lot of the country, it’s still exotic. And when Pok Pok wings were first becoming popular, fish sauce was likely not something many Western cooks had in their cabinets. Very finely chop the garlic, sprinkle on the salt, then chop the two together for 15 seconds or so. Scrape the mixture into small bowl, add the 1/4 cup of warm water, and let it sit for a few minutes. Set a fine-mesh strainer over another bowl, pour the garlic mixture into the strainer (or squeeze the mixture in cheesecloth over the bowl), and use the back of a spoon to stir and smoosh the garlic to extract as much liquid as you can. Reserve the garlic. Add the fish sauce and sugar to the bowl and stir until the sugar has fully dissolved. You should have 1 cup of liquid. Put the chicken wings in a large mixing bowl, add 1/2 cup of the fish sauce mixture, reserving the rest, and toss well with your hands. Cover and refrigerate for at least 4 hours, or as long as overnight, tossing every hour or so. Meanwhile, pour enough oil into a small pan to reach a depth of 3/4 inch or so and set it over high heat until it shimmers. Set a fine-mesh strainer over a heatproof bowl. Test whether the oil is hot enough: as soon as a piece of garlic added to the oil bubbles right away, add the rest. Decrease the heat to medium-low (you don’t want to rush the process with high heat), and stir once or twice. Cook the garlic just until it’s evenly light golden brown, about 5 minutes. Strain the garlic, reserving the flavorful oil for another purpose. Gently shake the strainer, then transfer the garlic in more or less one layer to paper towels to drain and cool. You should have 2 tablespoons of fried garlic. It keeps in an airtight container at room temperature for a day or two. Pour enough of the oil into a wok, Dutch oven, or wide pot (even better, use a countertop deep fryer) to reach a depth that will completely submerge the wings, about 2 inches. Set the pot over medium-high heat, bring the oil to 350 degrees Fahrenheit (use a deep-fry thermometer), carefully stirring the oil to maintain a consistent temperature, and adjust the heat to maintain the temperature. In a large mixing bowl, stir together the rice flour and tempura batter. Fry the wings in two batches. Toss half the wings in the flour mixture to coat them well and knock them against the edge of the bowl so any excess flour falls off before adding them to the hot oil. Add the first batch to the oil and cook, prodding the wings to move them around a bit after 4 minutes or so and then every few minutes, until they’re evenly deep golden brown and completely cooked through, 6 to 8 minutes. Transfer them to paper towels to drain, let the oil come back to 350 degrees, and do the same with the next batch. Add the 1/4 cup of water to the remaining fish sauce mixture, stir well, and set it aside. Work in two batches to finish the wings (if you have a very large wok, one batch will do). Add the 1/4 cup of the fish sauce mixture in a nonstick wok, set it over high heat, and bring it to a boil. Cook until the mixture has reduced by about half, about 45 seconds. Add half of the chicken wings, and cook, using tongs, a wok spatula, or a deft flick of your wrist to toss the wings in the liquid every 15 seconds or so, until the liquid has become a sticky, caramel-colored glaze that coats the wings, about 1 minute. Add 1 tablespoon of the reserved fried garlic, toss well, and keep cooking, tossing constantly, until the glaze has turned a shade or two darker, about 30 seconds more. Transfer the wings to a serving plate. The sticky coating seals in the heat, so this batch of wings should keep warm while you finish the next one. You can also keep the first batch in an oven set to warm. Rinse and wipe out the wok, and repeat with another 1/4 cup of the liquid, the remaining wings, and the remaining tablespoon of fried garlic. Reprinted with permission from Pok Pok: Food and Stories from the Streets, Homes, and Roadside Restaurants of Thailand by Andy Ricker with JJ Goode, copyright © 2013. Published by Ten Speed Press, an imprint of Penguin Random House LLC.